Micromax launched two new smartphones Canvas(A100) and Pixel(A90). 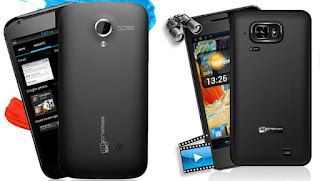 The devices are part of company's Superfone series of budget smartphones. Both A100 and A90 will be running Android's 4.0 Ice Cream Sandwich(ICS) operating system. Micromax A100 Superfone Canvas, has a huge 4.95-inch TFT LCD screen with a resolution of 480x854. The A100 runs on Android 4.0 ICS. It has 1GHz processor and 512MB of RAM. The device has 4GB internal and an expandable memory of up to 32GB via micro-SD card. It is a Dual Sim(GSM) phone. A100 has a 5MP auto focus camera at the rear with LED flash and a 0.3MP camera at the front useful for video calls. It has 3G, GPS, Bluetooth 2.1, Wi-Fi b/g/n and micro USB port for charging and data transfer. The Canvas is powered by a 2000mAh battery. Micromax A90 Superfone Pixel, has a huge 4.3-inch Super AMOLED screen with a resolution of 800x480. The A90 runs on Android 4.0 ICS. It has 1GHz processor and 512MB of RAM. The device has 4GB internal and an expandable memory of up to 32GB via micro-SD card. Like A100, the A90 is also a Dual Sim(GSM) phone. A90 has a 8MP auto focus camera at the rear with LED flash and a 0.3MP camera at the front useful for video calls. It has 3G, GPS, Bluetooth 2.1, Wi-Fi b/g/n and micro USB port for charging and data transfer. The Pixel is powered by a 1600mAh battery. The Micromax A100 Superfone Canvas is available for Rs.9999 and the Micromax A90 Superfone Pixel is available for Rs.12999.